The most gloriously violent racing game ever made is making a Kickstarter-funded comeback. 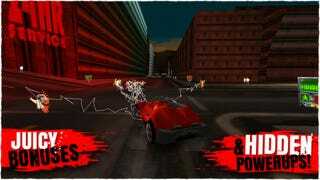 To thank the folks that gave their money so the vehicular genocide could continue, Stainless Games is offering the iOS re-release of the original Carmageddon for free. What are you waiting for? Reworked with touch screen controls, achievements, and the ability to save replays and share them online, Carmageddon for the iPhone and iPad is sure to bring back fond memories of exploding pedestrians and... well, that's all that really matters. I've not played the iOS version yet, but reviews look incredibly promising. You should get it right now, so you don't have to complain about spending money in case the reviewers are wrong.